OMAHA, NE – Get ready for a holiday surprise at this year’s kickoff to the Omaha Holiday Lights Festival. Visit Omaha has created “Holiday Island” in the Gene Leahy Mall as a gift to all of the residents, visitors, attractions, event organizers, restaurants and businesses that make Omaha an incredible visitor destination. • Giraffe with a chef hat: Omaha’s world-class zoo and dining scene. • Artist’s paint palette: Art museums, galleries and artists that make Omaha a cultural oasis in the plains. • Baseball glove: Omaha sporting events, from national and world competitions to regional and local tournaments. • Cello and ballet slippers: Performances, stage productions, performing arts organizations, theaters and venues. • Poinsettia tree and LEGO Bob: Omaha’s nature scene, from the riverfront and biking trails to the botanical gardens, lakes and city parks. • Train: Omaha’s history and all of the places dedicated to preserving and sharing it. • Gingerbread family: The variety of family activities sprinkled throughout the city. Installation of Holiday Island begins Monday, November 21, 2016 and is expected to take two days. Decorations will remain through the first week of January 2017. We encourage everyone to check out Holiday Island and share their photos with #OmahaWeekend. 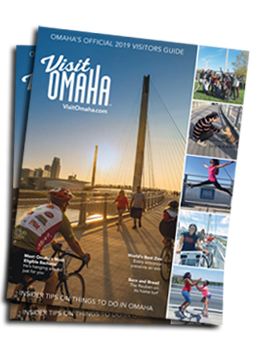 Go to VisitOmaha.com/HolidayIsland for ideas on fun things to do throughout the holidays with visiting friends and family. Also, check out the behind-the-scene photos to see how Holiday Island came together. Visit Omaha partnered with Clark Creative Group and Heartland Scenic Studio to create and install Holiday Island.